TheRustedChain - The Blog: Duck Dynasty and 'Merica. Some day soon I plan on breaking out my big camera again. Doing real photos and real blog posts. But this season of my life hasn't allowed much time for it. At all. So I'm back to the ol' blog here with a few cell phone shots. Sunflowers in my kitchen. 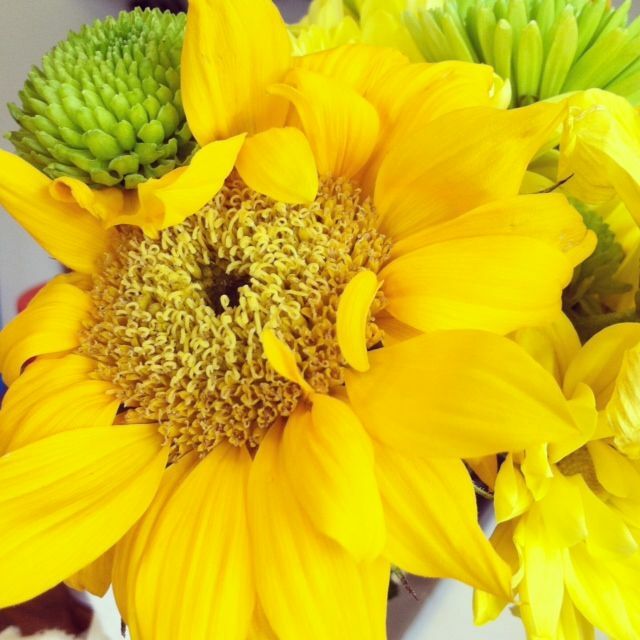 Because nothing brightens a room like sunflowers! 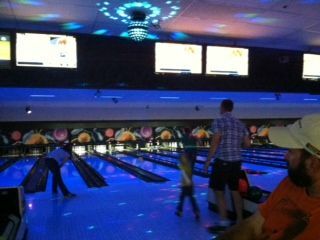 Over the weekend we went cosmic bowling with friends and family. So fun! I thought for sure I'd be sore the next day and surprisingly I wasn't. I did break a nail though. I'm such a girl. 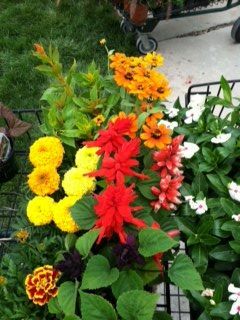 Each year our bank hosts a big sale at the local nursery. I've blogged about it here. This year I just had my phone in my pocket to grab a photo or two. I'm so happy to start seeing color in the yard again!! Gosh, I love color. 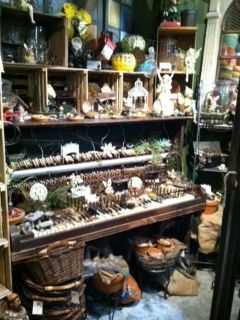 This is a bit hard to see, but it's a FABULOUS display made with an old beat up piano! So if you happen to have an old piano on hand, here you go. Put stuff on it and call it art. This? This is small town USA. 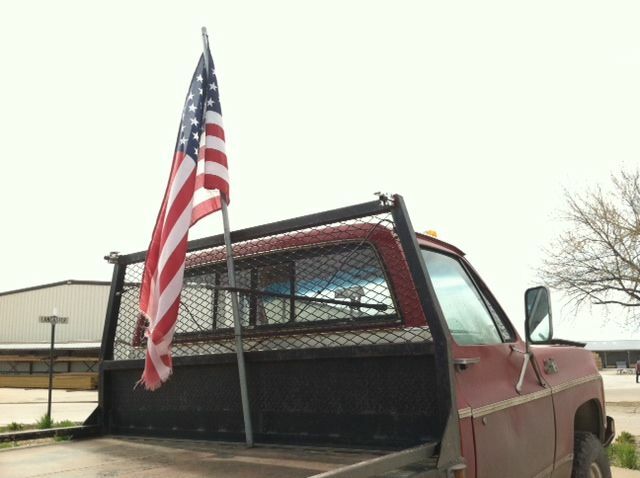 This is 'Merica. And I love it. 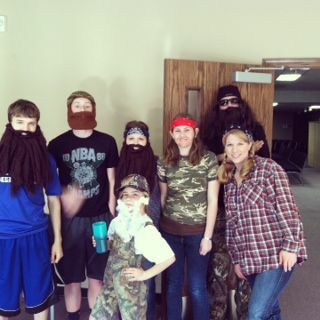 The church youth group had Duck Dynasty night. They were to dress as characters from the show. They watched Phil's testimony. (so good!) They had tables lined up long across the room where they sat around and shared a meal, saying a prayer before they ate, of course. There was a Duck Dynasty trivia game. They had jambalaya, sweet tea in mason jars, and a frog leg eating competition. 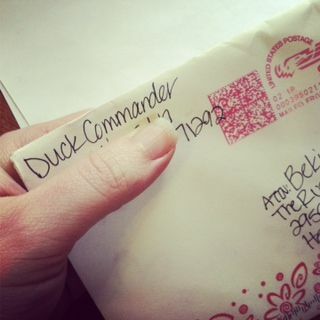 A few days later, I received a card in the mail from Duck Commander! For real! It was a handwritten card from Korie telling me that she and Sadie love our jewelry. Good gravy!! My kids were completely in awe! I've said it so many times lately, but what a blessed, busy, & beautiful life this is!! I love that youth group idea, I'm gonna pass that along to our youth pastor. His testimony is powerful! SO cool that your jewelry business has such a COOL following :-) Congrats Beki! Wow, a card from the Duck Commander! Not everyone gets that. No planting here in Eastern Kansas-heck we have SNOW flying RIGHT NOW!! !